The Screaming Pope: Is the Enemy of Your Enemy Necessarily Your Friend? Is the Enemy of Your Enemy Necessarily Your Friend? During his speech to congress Benjamin Netanyahu said, “When it comes to Iran and ISIS, the enemy of your enemy is your enemy.” His notion is that ISIS and Iran have similar millenarian goals. They’re merely rivalrous siblings, with the same murderous objectives--the control not only of Islam but of the world in general. But Netanyahu’s idea is interesting in an almost Halachic way, to the extent that it turns over obvious assumptions. Perhaps we have been lulled to sleep by the Sunni and Shiite conflict. 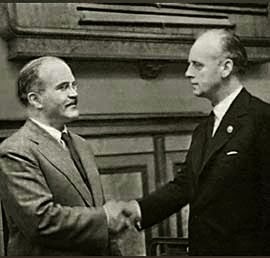 The Nazis and Russians were enemies until they signed Molotov-Ribbentrop Pact of l939. Of course they would become enemies again. It’s comforting to think of Iran as our silent and strategic partner in the Mideast due to the conflict with the Sunnis. Netanyahu’s point is that the US and Iran are strange bedfellows, maybe like Norman and Marion in Psycho. Will the animosity between Sunnis and Shiites take precedence over the conflicts with the West? Amidst all the threat of terrorism there has been a comfort in imagining a strong Iran as a bulwark against what has seemed like the far more threatening extremism of both al-Qaeda and ISIS. And Netanyahu’s speech gives little credit to the huge divide between Iran and other countries in the Middle East. Iran’s relatively cosmopolitan society and culture is a far cry from Syria, Iraq and it’s certainly Egypt. Still two negatives don’t necessarily makes a positive. How many times have we armed insurgent forces only to find our own weapons eventually being used against us?